Octreotide Acetate Peptide is a very potent inhibitor of many hormones such as growth hormone, glucagon and insulin. 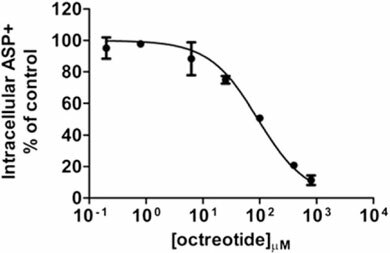 Octreotide acetate Peptide mimics the effects of natural hormone somatostatin. Octreotide acetate is the water-soluble acetate salt of a cyclic octapeptide. It is used in the treatment of diarrhea associated with carcinoid tumors, and profuse watery diarrhea associated with vasoactive intestinal peptide tumors (VIPoma). It is also a treatment for acromegaly. Each vial contains 5 mg of lyophilized solid packaged under an inert gas and supplied as an acetate salt. Visentin M et al. 2015. J Pharmacol Exp Ther. 355(2):145-51. PMID: 26330539. Inhibitory effect of Octreotide Acetate Peptide (Cat. No. 350305) on OCT1-mediated transport in OCT1 transfected HEK293 cells (from Visentin M. et al. 2015).